There’s a reason Facebook is the top platform for both B2C and B2B businesses: Facebook ads work. Perhaps a little too well. Despite recent scandals, Facebook remains the world’s biggest social media platform. More than one billion people log on to Facebook every day. Facebook ads remain one of the most important components of any social media marketing strategy. But between formats, specifications, placements, objectives, and calls-to-action, there’s a lot to figure out. 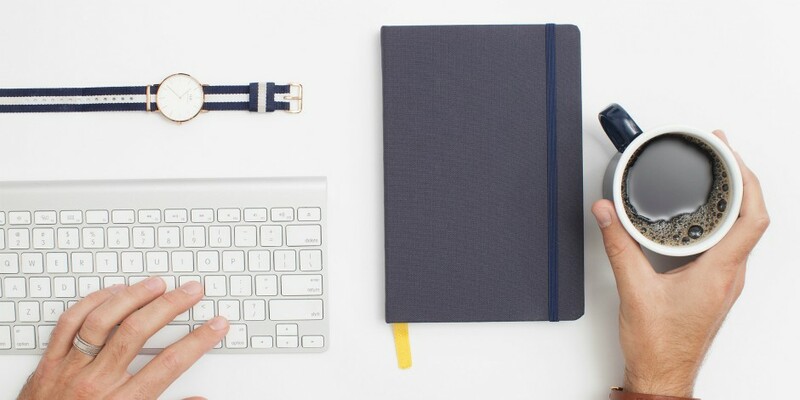 This guide will cover the key differences and benefits of the top Facebook ad types. Read on to determine which ads will best help you accomplish your business goals and maximize ROI. All ads on Facebook are required to have an image, and that’s because images are powerful. They’re the first things people will see when engaging with your ads. That’s also why a well-executed Facebook photo ad is often enough to do the trick. Single image ads are the easiest to make on Facebook. Start with a clear concept, then find or create a standout image and accompany it with copy and a clear CTA. 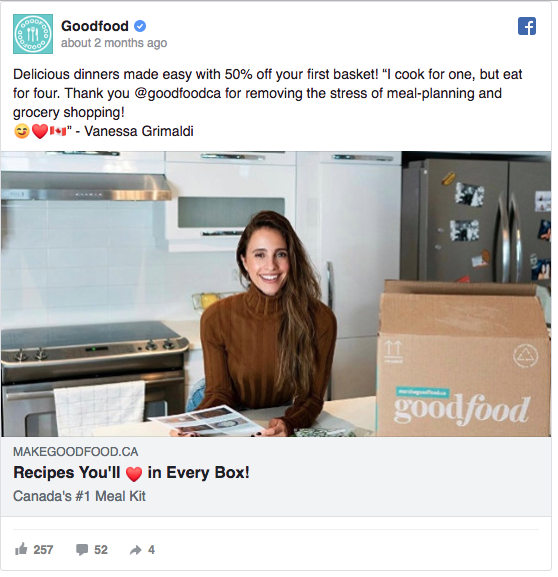 These ads can be used across the most placements on Facebook, making them especially ideal for accomplishing brand awareness, engagement, reach, and even store visit goals. Choose a compelling subject. Arrangements, people, or displays are among the options recommended by Facebook. Make quality a priority. No blurry, over or under exposed photos. And upload at the highest resolution possible. Try to use little or no image text when possible. Facebook has found that images with less than 20 percent text perform better. Use Facebook’s Image Text Check tool to make sure you’ve got a good text-to-visual ratio. Avoid using too much text, especially in the thumbnail. If you want to include more than one image, then Slideshow, Carousel, or Collection ads are the way to go. Video continues to reign supreme on Facebook, especially on mobile. “For businesses, winning on mobile now means winning on video,” said COO Sheryl Sandberg in a recent earnings call. Facebook research shows that people spend an average of five times longer with videos than they do with static content. Plus, 30 percent of mobile shoppers say video is the best medium for discovering new products. Video ads excel at driving reach, engagement and conversions, and can be placed pretty much anywhere a photo ad can—including on Instagram. Use thumbnail images and titles that will grab attention. Capture attention quickly. You’ve got an average of 1.7 seconds before people may decide to move on. If you can hold attention beyond the first three seconds, 65% of viewers will watch for at least another 10 seconds. Keep videos short and sweet. Up to 47% of value in a video campaign is delivered in the first three seconds, versus 74% in the first 10 seconds. Optimize for mobile. Mobile-optimized Facebook video has been shown to lift brand awareness to 67%. Upload the highest resolution video available. Make your videos accessible with captions. Captions have also been shown to increase video view time. Create for sound off. Most video ads in the mobile feed are played on mute. Explore formats. Facebook 360 videos capture interest for 40% longer than standard video. Most file types are supported. You can see the full list here. Facebook recommends: H.264 compression, square pixels, fixed frame rate, progressive scan, and stereo AAC audio compression at 128kbps+. Make sure your video does not have letter or pillar boxing (aka black bars). See a full list of Facebook video ad specs here. Slideshow ads bring the best of images and videos together in a lightweight and cost-effective package. 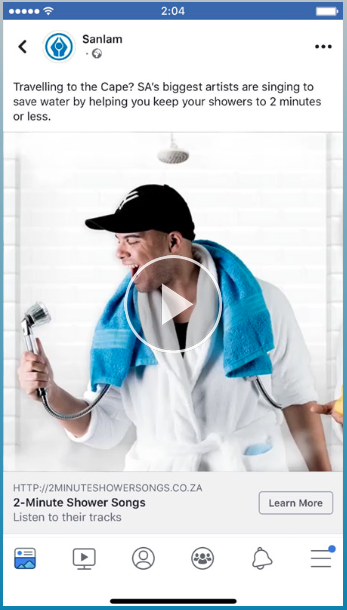 Described by Facebook as “video-like” ads, slideshows are in essence an easier alternative to video. There are typically two reasons you may opt choose a Facebook Slideshow Ad. If you’re on a tight timeline or budget, this format allows you to add eye-catching motion to multiple images, without the production costs. You can upload original photos, or select from Facebook’s stock image library. Alternately, if your audience is located somewhere with poor connection speeds, low-bandwidth slideshows are a great alternative to video. If you have a pre-existing video, you can simply upload it and select the stills you would like to use in slideshow format. If you want to showcase a range of products or tell a story in parts, the carousel ad format may be the best fit. In this format, you can upload between two and 10 images or videos that users can swipe through. Each slide of the carousel is accompanied by a call to action that’s typically also used in the entire final slide. There are 18 call-to-action buttons you can choose, ranging from Call Now to Subscribe. Supported carousel ad objectives include everything from lead generation to promoting in store visits. Carousel ads can appear in the mobile and desktop News Feeds on Facebook and Instagram. They can be created from a page, event, the Ads Manager, or the Ads API. Find step-by-step instructions on how to create carousel ads here. Take advantage of the format. Use each slide to showcase a range, a series, or develop a narrative. Use images that complement each other. Don’t choose visuals that clash aesthetically or tell an incoherent brand story. Show your best-performing carousel cards first—when it makes sense. If you’re using the format to tell a story, it’s best to keep them in order. Be creative. Target used a Facebook Carousel ad to share a recipe idea for every day of the week. Betty Crocker used each slide for a recipe step. Consider spreading a single long image across a carousel ad. If you’re trying to communicate something mysterious, panoramic, or epic in scope, this can have a cool reinforcing effect. Here’s how to make one. 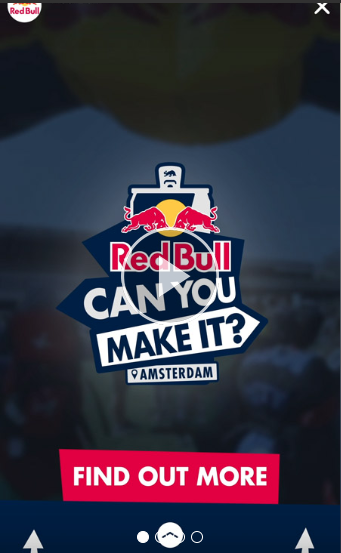 Check out Facebook Carousel’s Creative Examples page for inspiration. In many ways, Collection Ads are the attention-grabbing News Feed gateway to Instant Experience Ads. This hybrid, mobile format allows you to combine video, slideshow or images, and is designed to improve traffic, conversions, and sales for your business. Most often a collection ad will feature a hero image or video alongside itemized product shots. When someone clicks on a Collection Ad, it will bring them to an immersive Instant Experience. This ad format is ideal for online retailers hoping to convert interest into immediate sales. Instant Storefront: For when you have four or more products to showcase. Use this template as a mobile landing page when you want to drive people to your website or app to make a purchase. Instant Lookbook: Use the lookbook to tell a brand story, showcase your products in use, and inspire sales. Instant Customer Acquisition: Use this template when you have specific conversion goal, like visits to your website or other actions. Instant Storytelling: Ideal for brand awareness and consideration objectives, use this template to tell your brand story to new customers. Or, share a new story with pre-existing customers. To create a Collection Ad, follow this step-by-step guide. The different specifications for each template can be found here. Touted as the new and improved Canvas, Facebook Instant Experiences are mobile-only, full-screen vertical ads. This format is all about capturing the full attention of your audience. It even comes bundled with Pixel, making it easier to re-engage visitors. True to its name, Instant Experiences are also lightening fast, loading 15 times faster than standard mobile web pages. That’s game changing, especially since it takes most pages an average or 22 seconds to load, and half of visitors bail after waiting three seconds. 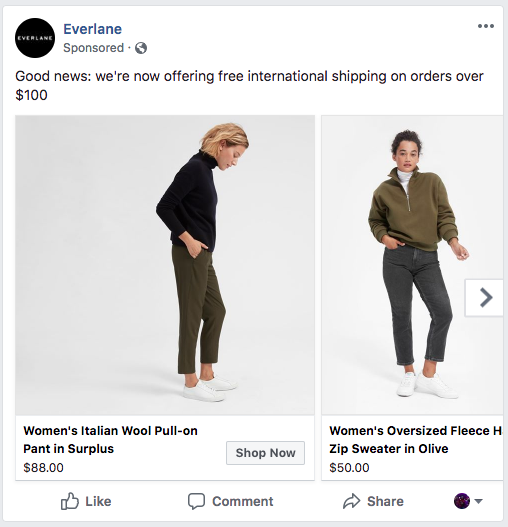 When paired with any other Facebook ad format, Instant Experiences become the quick, post-click destination for in-app conversions and engagement. Since they’re designed for Instant Experiences, the five Collection Ad templates are often the best choice. An Instant Form template (formerly known as a lead form) is also available, which is a good choice if you’re looking to capture leads and gather contact information. Tell a cohesive story. Your cover media should complement the content that follows. Highlight product diversity. The more diverse your set is, the better the chances are you’ll catch someone’s attention. Give people reasons to explore more. Showing a variety of different images under your cover media usually inspires people to tap More. Present clear steps for viewers to take. Use the right CTAs throughout the experience. Optimize for mobile. A weak mobile site will be a disappointment to high-intent visitors. Explore effects. Tilt-to-pan effects and images tagged with products are among the new features added to Instant Experiences. Add URL parameters to the correct location. These deep links will be able to track product and other page visits, as well as the link to your website. Custom Instant Experiences can be created in Ads Manager, Creative Hub, or from your Page. Stories are full-screen images or videos that disappear after 24 hours unless saved. Thanks to their popularity, more people may be familiar with Instagram Stories, but Facebook Stories are worth considering – especially since they’re the fastest growing ad format. More than half of the people who use stories across Facebook, Messenger, Whatsapp, and Instagram say that they are making more online purchases as a result. 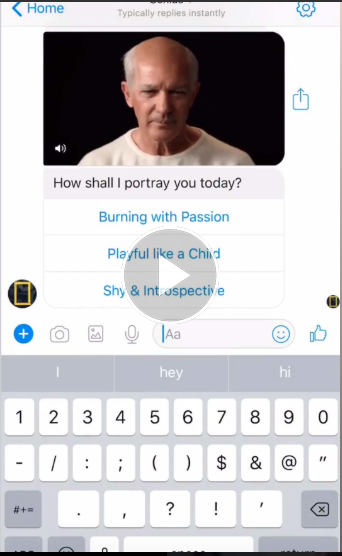 Facebook Stories cannot be selected as a standalone placement when creating an ad. It’s included under placements when you select Automatic Placements. But for it to work, you have to be using an objective that supports Facebook Stories (reach, traffic, app installs, video views, conversions, brand awareness, lead generation). Instant Forms are also compatible with Facebook Stories, popping up as easy-to-complete surveys. Maximum image duration: 6 seconds. Maximum image file size: 30 MB. *Captions are not available. Make them a part of the file if you plan to include them. Use the Ads Manager or the API to create ads in Facebook Stories. Facebook Messenger—not Facebook—is the top mobile app in terms of downloads. Without a Messenger ad strategy, you may be missing out. These ads appear in a user’s inbox, and can be formatted as an image carousel, video, or dynamic ads. Messenger inbox ads are created by adding Messenger Inbox as a placement for your campaign. But according to Facebook, the best way to setup Messenger ads is to use automatic placements. Automatic placements send ads to the place most likely to have the best results at the lowest cost. If your business is active on Messenger, Click-to Messenger ads might also be worthwhile. These ads put people into direct conversation with your business. You can also send Sponsored Messages to customers your business has already spoken with on Messenger. These will appear in the conversation thread of their inbox like any other message. Click here to learn how to setup Messenger Ads. Lead ads can be used for a variety of customer acquisition needs – from newsletter subscriptions, to quote requests, to event registration. When someone clicks on a lead ad, they’re presented with a context card that provides additional information. This is where you can tell people about your business, your offer, and explain why they should share their information with you. Contact information is pre-populated, which makes it easier for people to sign up and leads to minimal drop-off. Custom questions can also be added to learn more about your audience. Facebook lead ads can be created from your Page or from Ads Manager. Learn how to create one here. Keep it brief. Long forms lead to lower conversion rates. Avoid open-ended questions. These questions are harder and take longer to answer, leading to more drop off. Use multiple choice. Don’t provide too many choices. For multiple-choice questions, stick to around three to four options. Say thanks. Add a custom “thank you” to show your appreciation. Dynamic ads allow marketers to promote products from any catalogue to people who have shown interest on your website, in your app, or anywhere else on the web. Dynamic ads can be created in the image, carousel, or collection ad format. The key difference is that instead of creating individual ads for each product, dynamic ads allow you to create a template that automatically pulls images and information from your catalogue. So, if a website visitor looked at a pair of shoes on your website, the dynamic ad will retarget them with the same information without you having to upload images and copy. Setup your catalogue. To ensure your inventory is prepped to be dynamically pulled from, double check Facebook’s catalogue specs. Implement Pixel. For dynamic ads to work, Facebook Pixel must be implemented on your website. Schedule updates. If your catalogue changes regularly, scheduling uploads will help maintain accurate prices and stock figures. Dynamic ads can be created in the Ads Manager. Learn more here. Link ads have one clear goal: To get people to visit your website. Every component of the link ad is clickable, so butterfingers or mouse slippages are not an issue. This may be why businesses using Link Ads on Facebook have seen a 53 percent ROI. Choose a winning image. High quality, vibrant, clear photos always perform best. Prompt with crisp copy. A sharp headline and descriptive text will help inspire clicks. Include a CTA Button. Choose from: Shop Now, Learn More, Sign Up, Book Now and Download. Describe the destination. Tell your customers where their click will take them, that way they click with purpose. Visit the Ads Manager to create a Facebook Link ad.